20 August 2018. View the original article on Sustainable Brands. 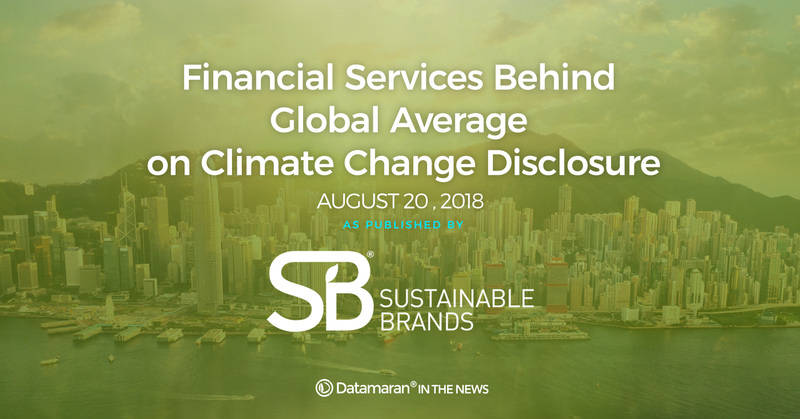 In the data brief released today, Datamaran compares the TCFD financial services signatories to other (non-financial services) sector signatories and explores how they disclose on climate change-related risks in their annual financial reports. The brief reveals a gap between the two. Twice as many non-financial services signatories report on climate change with a high emphasis compared to financial services, which make up 50 percent of the TCFD signatories. Further findings include that non-financial services are more proactive in climate change reporting. They started to put more emphasis on climate change in their reports a year before the TCFD recommendations were released, going from 31 percent in 2014 to 43 percent in 2015. The study shows that financial services signatories are observed to be more reactive. It was only the year after the TCFD recommendations were introduced that an increase was seen in high emphasis reporting on climate change topics. Interestingly, in 2018, financial services saw a 10 percent drop in high emphasis reporting on greenhouse gases but saw a 14 percent rise in climate change disclosure. Three years after the TCFD recommendations were released, the gap between the sectors on high emphasis reporting has been reduced, moving from 31 percent in 2016 to 15 percent in 2018. Further details of the research could be found in Datamaran’s data brief, available here. This isn’t the first time the sector has been called out for lagging behind the curve: Earlier this year, after the UK’s Department for Work and Pensions admitted that there is widespread misunderstanding amongst trustees on the scope of their fiduciary duty in relation to environmental risks, the Environmental Audit Committee (EAC) called on top pension funds in the UK to disclose information on the risks that climate change poses to pension savings. 25 pension funds, with assets under management worth £555 billion, were issued letters by the EAC, in which they were asked to provide responses to nine questions focused on climate risk. Based on the responses, the EAC would determine how the TCFD recommendations should be implemented. But the tide is indeed changing, and tools are emerging to help the finance industry catch up: Last month, 16 global banks, the UN Environment Finance Initiative and climate risk advisory firm Acclimatise published new methodologies that will help banks understand how the physical risks and opportunities of a changing climate might affect their loan portfolios. The methodologies are designed to enable banks to be more transparent about their exposure to climate-related risks and opportunities, in line with the TCFD recommendations.